Atrial fibrillation is a medical condition that is characterized by an irregular and frequently rapid heart rate that can hamper blood circulation in the rest of the body. The condition causes the atria (the upper chambers of the heart) to beat sporadically and not in coordination with the ventricles (the lower heart chambers). As one may have surmised, atrial fibrillation keeps the heart from beating efficiently. The proper amount of blood may not be getting forced through the body with every heartbeat. So what are the signs and symptoms that are associated with this disease? Unfortunately, this cardiological condition does not always produce noticeable symptoms. This means that it’s not uncommon for people to be completely unaware that there is any issue with their heart until the atrial fibrillation (also known as A-fib) is diagnosed during a routine physical examination. Occasional – Also known as paroxysmal (par-ok-SIZ-mul) atrial fibrillation. Patients may experience symptoms that come and go, persisting for as little as a few minutes to more than several hours before stopping. Persistent – This type of atrial fibrillation produces more severe symptoms that will require treatment in order to stop. People suffering from persistent A-fib may even need to undergo electrical shock therapy to restore a healthy heart rate. Permanent – Patients with this form of medical condition won’t ever be rid of the abnormal heart rhythm. Symptoms will be permanent, but there are treatments available to help control a patient’s heartbeat. Patients with this condition are at greater risk of blood clots and will require blood thinners. 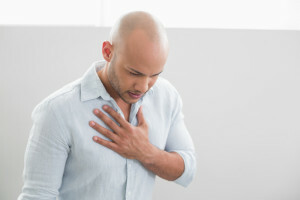 If you or a loved one have experienced any of these signs and symptoms related to atrial fibrillation, then please don’t hesitate to schedule an appointment with your doctor or a cardiologist. They may need to order specific medical tests, such as an electrocardiogram, in order to confirm the atrial fibrillation or rule out other possible heart rhythm disorders (arrhythmia). If you start experiencing chest pain, then please seek medical attention immediately. This could be an early sign of an impending heart attack.